Relish the memory. : Chocolate + Raspberry = Combined Romance. Chocolate + Raspberry = Combined Romance. The amalgamation of these two extraordinary foods somehow manages to combine both sensuality and purity into one exquisite love affair. With my busy schedule recently, I have had limited opportunity to create my own edible treats. So I thought I would share with you a few clever people that have fused these ingredients together to create their own culinary treasures. In following from the tart event…the combination of White Chocolate and Raspberry landed in my letterbox in large bar form wrapped in gold foil by our beloved friends Brian and Andrew. In collaboration with a bunch of talented entrepreneurial school girls the Whittaker brothers skillfully crafted a block of White Raspberry goodness for the best possible cause. Comparable to the role of a bra, to show their support for the breasts of kiwi women they are gifting 20 cents from every bar sold to The New Zealand Breast Cancer Foundation. The blend of tangy freeze-dried raspberry pieces, tiny flecks of raspberry powder encased in a bed of smooth ivory create a truly wonderful sense of pleasure! After some vigorous taste-testing and collaboration my bosom buddy’s and I determined the chocolate a touch salty, and hugely addictive. To add to their accolade of ‘greatness’ Whittakers have also managed to capture a few moments of the culinary queen Nigella Lawson on their latest infomercial. (If you haven't seen it yet, you will no doubt spot it soon) An admirable achievement and exceptional marketing triumph. Although I must admit their newly popular Peanut Butter Chocolate could do with a switch from smooth to crunchy. Just saying. 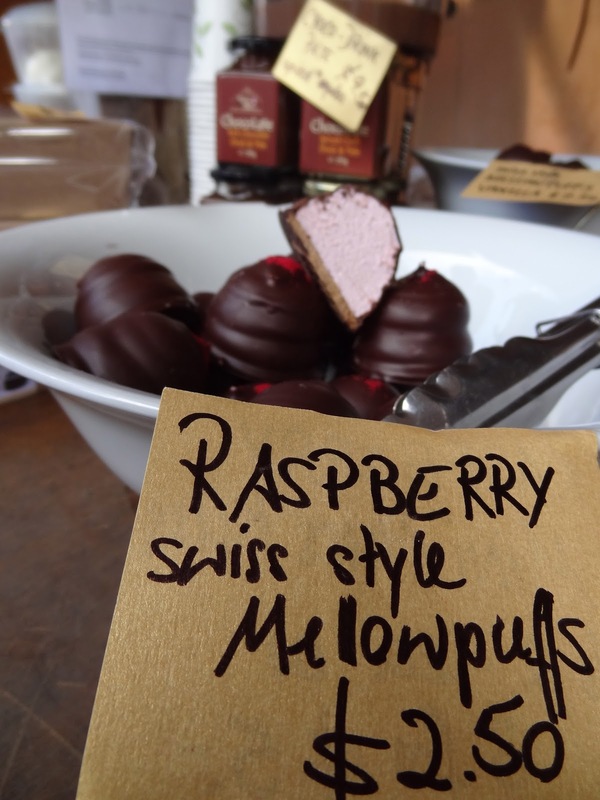 On a recent adventure north of the big city, the Matakana Village Farmers Market tempted us with these luxurious and extravagant Raspberry Swiss Style Mellowpuffs. Homemade marshmallow is something of a delight and if you have never attempted it I recommend that you do. This giant handcrafted treat was light, fluffy and mourish and the Espresso & Cinnamon version is first on my list to sample upon my return. I suppose we have established that while Chocolate adds the sensuality and romance; Raspberry has the purity and freshness covered. Its radiant pink hue and tiny nobbly segments morph into one delightful and slightly seedy berry. They scream lip-smacking summer and quite frankly they scream it from the rooftops. A belated search to provide my brother with a sweet birthday treat, lead me to purchasing these rich chocolate raspberry baby morsels from the artisanal works of The Caker. The most recent birthday celebration called for a special cake, for a very special girl. After experiencing great things, I knew exactly the lady to call to create something worthy of the occasion. Despite usually requiring at least 3 days notice, this talented and passionate baker whipped us up a wholesome, specialty masterpiece in a matter of hours. The Caker aka. Jordan Rondel crafts her treats in the kitchen behind ‘eightthirty’ a quaint wee café at the start of K’ Rd. After seeking advice from the expert herself, the Flourless Dark Chocolate Cake w. Silky Ganache and the addition of raspberries was a truly delectable and sinfully fabulous option. The 70% dark chocolate lead to 200% pleasure. Sprinkled with fuschia pink raspberry powder and finished with toffee crisps, it was a taste sensation that you MUST experience. Jordan whips up other flavours such as Chai Latte Cake w. Condensed Milk Icing, Vegan Pumpkin Spice Cake w. Coconut Vanilla Bean Icing and wait for it…Nutella Banana Cake w. More Nutella and Crunchy Banana Crumbs. Time to wipe the saliva from your chin and check out her website. Or better yet, head down to eightthirty treat yourself to a coffee and sample a slice of heaven. Whatever your motive or rationale to indulge in these treats, with a marriage of flavours like this, you would be crazy to refrain from doing so.